Soda is a worldwide guilty pleasure. While may can’t stop drinking sodas, studies have shown that is has no nutritional value whatsoever. In fact, the American Heart Association stated that excessive sugar intake (which is highly evident in sodas) can lead to heart disease and stroke. So why exactly is soda bad for your health? Phosphoric acid in sodas are used to sharpen the flavor. While the body can regulate the phosphoric acid intake with its release of calcium, the power of the latter eventually fails. Since the normal ratio of phosphoric acid-calcium should just be 1:1, soda drinkers end up with 2:1 or even up to 5:1. Majority of sodas contain not natural sugar but high fructose corn syrup. HFCS converts highly to fat compared to other forms of sugar. If high amounts are taken (drinking sodas too often), it inhibits copper metabolism. This can the lead to brittle bones and defective tissues. If this isn’t alarming enough, those who have high intake of HFCS have increased dramatically. Since its introduction to products like sodas, obesity has doubled since 1980. Increased intake of caffeine can also harm your body. Studies have shown that caffeine perks you up and inhibits sleep after. This can greatly affect anyone’s physical and mental health. Moreover, it heightens the hormone cortisol, which prompts greater stress and pressure to the mind and body. If that’s not enough for you, expect to experience cardiovascular problems, emotional discomfort, prolonged stress and anxiety— among others. So if you ever encounter another can or bottle of soda, think again. Not only are you gaining 15 pounds annually, you’re making your body a walking time bomb. 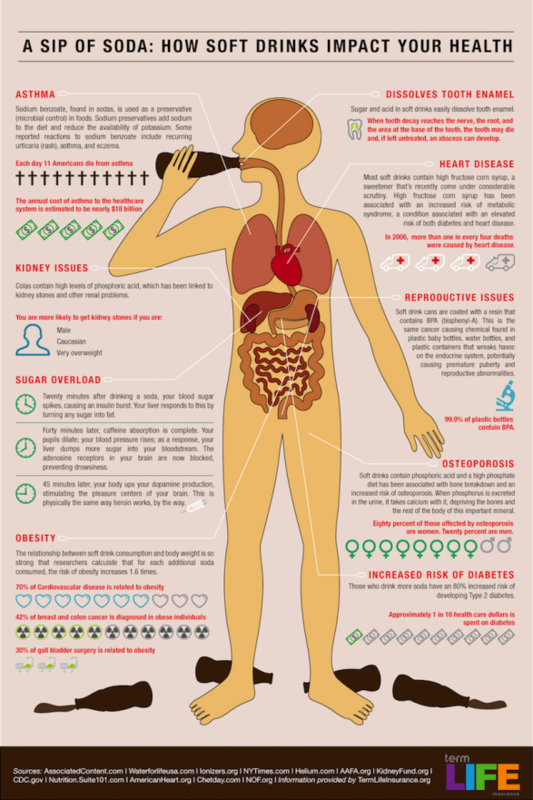 If you want to learn more, see this visual infographic about the effects of soft drinks on your body.